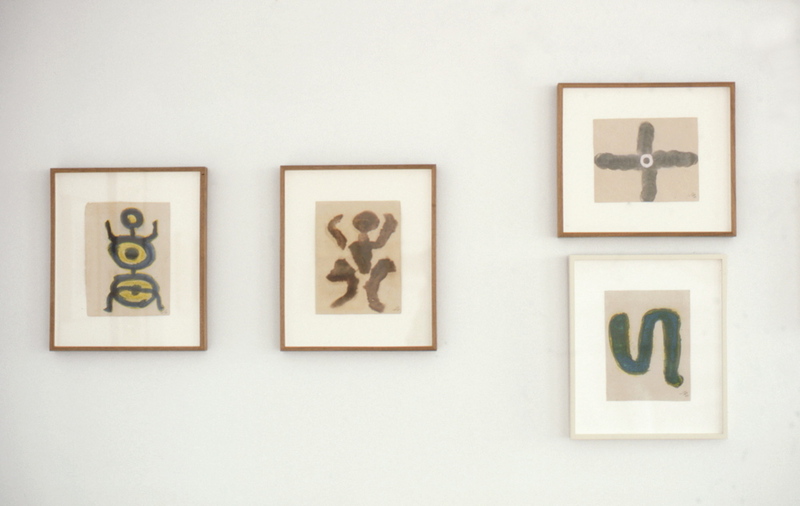 We are pleased to announce the upcoming exhibition of of over twenty works on paper by Acharya Vyakul (1930–2000) at Lawrence Markey Gallery. This exhibition --which has recently become a memorial exhibition-- will be the first exhibition of Vyakul's work at Lawrence Markey Gallery. Acharya Ram Charan Sharma, a.k.a. "Vyakul" (meaning "the excited one" in sanskrit) was born on September 20, 1930, in a village of Rajasthan, India. Soon after his birth Vyakul's family moved to the nearby capital town of Jaipur, where Vyakul lived his entire life. In May of this year (2000), in Jaipur, Vyakul passed away. ... He has no studio. Works anywhere, in this or that house, in his bed, while travelling, in this or that room, often at night, without any special light. (He paints only) a few times each year and for a few days, when it really "overruns" him, he says, when it "overwhelms" him; when his eyes "catch fire". He makes his colors himself, grinds in his mortars plants, stones, clay, cow's urine, coal, glues, flowers and powders ... what's at hand. Sometimes without a brush, his fingers are sufficient. Vyakul began painting at an early age, working in the "tantra-folk" style (a blend of popular and tantric painting), and for some time Vyakul's works were mistakenly labeled anonymous (they were then unsigned), "tantric" paintings. It was not until 1988, that Vyakul's work was "discovered" in Jaipur by the French poet Franck André Jamme, who saw that it was included in the 1989 exhibition Magicians de la Terre, at the Centre Georges Pompidou, Paris. Here, the work was finally credited as that of a unique, artistic hand, and reached its largest audience to date. Vyakul's work subsequently received further critical attention at exhibitions at the art gallery of fashion designer Agnès B., in Paris.